SANTA CRUZ, CA -- (MARKET WIRE) -- November 1, 2005 -- Onset Technology, a leading developer of software for wireless handheld devices, announced today the availability of a new version of its METAmessage® for Wireless software. The new Professional version adds the ability to quickly access contact information from virtually any enterprise contact resource management (CRM) application. 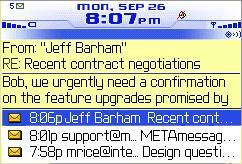 Added METAmessage Professional features, specifically designed for users of the BlackBerry® wireless platform from Research In Motion (RIM) (NASDAQ: RIMM) (TSX: RIM), include an Outlook-like "Preview Pane" that can show complete BlackBerry Inbox Sender: and Subject: information and the first lines of the message body. Onset also announced a special offer, available only in Q4 2005, of 10 free licenses for every purchase of 20 Professional licenses plus a waiver of Professional server upgrade fees. "We've consolidated our comprehensive and most popular features into a package that every BlackBerry deployment will consider a must-have," said Gadi Mazor, Onset's CEO. "For mobile professionals, the ability to quickly access contact information from CRM applications is mission critical. This, plus features such as the new preview pane and submitting data via convenient forms, plus our special pricing, make buying or upgrading to METAmessage Professional an easy decision." custom message alerts, get quick info, and much more. Onset recently announced the availability of a new Emergency Communications package that turns any BlackBerry deployment into an emergency communications network, providing automatic PIN updating, PIN address directory, PIN blasts, custom alerts, read/receipt notifications, PIN archiving, and document storage. METAmessage for Wireless also provides Legal, Financial, Professional Services, and Voice solutions for the BlackBerry platform using both BlackBerry Mobile Data System™ and BlackBerry email protocols. Founded in 1997, Onset Technology is the developer of METAmessage® for Wireless -- unique software solutions for law firms, financial services, government and public service agencies, and professional services companies. These solutions provide productivity enhancements, emergency communications capabilities, and secure access to virtually any data on their networks using wireless devices such as BlackBerry® handhelds from Research In Motion (RIM). The software is broadly compatible with virtually all wireless devices and servers including those from partners Microsoft and RIM. Since its introduction, METAmessage has been widely adopted by Fortune 1000 companies, government agencies, and a range of large service organizations. For more information, visit www.onsettechnology.com. METAmessage® is a trademark of Onset Technology. The BlackBerry and RIM families of related marks, images and symbols are the exclusive properties and trademarks of Research In Motion Limited.